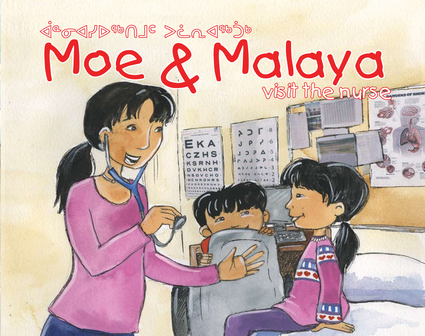 Follow Moe and Malaya as they make fascinating discoveries at the nurses' office.Follow Moe and Malaya as they make fascinating discoveries at the nurses' office. Moe wants to play with his best friend and cousin, Malaya. But before they can go exploring, Malaya has to visit the nurse for a checkup. What seems like an ordinary visit is going to be a funfilled learning experience with Moe coming along. What does a nurse do? Can you become a nurse? What do they do with all their crazy tools? With a keen eye for what captivates young readers, this book will teach curious children about nurses and their strange instruments, including that funny looking necklace, the stethoscope. On their visit the children learn about the unique career options nursing has to offer. While joining Moe and Malaya on their visit, children will learn how cool nursing can be and how they can become a nurse too! Alan Neal is a Canadian journalist and playwright whose first project involving the creatures of Inuit myth was on a film Neil Christopher was making in Iqaluit years ago about the demon Mahaha. Alan’s tasks then included coaching child actors, wrangling dogs, and performing the role of Grip #3. Although the film never did get finished, Alan fell in love with both the stories and the beauty of Iqaluit. He currently hosts the CBC radio program All in a Day in Ottawa, and has also hosted the programs Ontario Today, Bandwidth, and Fuse.Peggy Collins is an Inhabit Media illustrator.